Oesterr. Bot. Z. 8: 180. 1858. Anthurium lancifolium var. albifructum Croat, var. nov. TYPE: Panama. Chiriquí: N of San Felix, along mining road 18-27 mi. N of Pan-American Hwy. (above turn-off to Chame or Escopeta), 1,200-1,500 m, ca. 8°34'N, 81°52'W, Croat 33099 (MO 2381151,holotype). 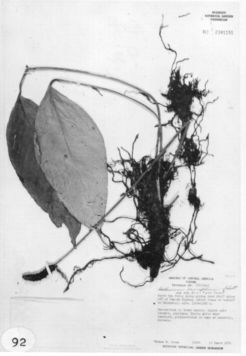 Planta terrestris; cataphyllum basi findens, apice per-sistens plus minusve intactum; petiolus teres, 22-38 cm longus; lamina crasse chartacea, anguste ovato-lan-ceolata, basi acuta ad leviter atlenuala, 20-33 cm lon-ga, 8-12 cm lata, pagina superiore inconspicuo glan-duloso-punctata, pagina inferiore dense et conspicue glanduloso-punctata; inflorescentia erecta; pedunculus teres, 22-52 cm longus, modice membranacea, viridis, lanceolata, 3.5-6 cm longa, 5-15 mm lata; spadix albus aut pallide viridis, 4.5-5.5 cm longus; baccae albae, obovoideae. Terrestrial herb; stems less than 12 cm long, 1-1.5 cm diam. ; internodes short; leaf scars hidden by cataphylls and roots; roots spreading, relatively few, ca. 3 mm diam. ; cataphylls 4-5 cm long, acuminate at apex, turning reddish brown and weathering to fibers at least at the base, the upper part remaining partly intact, sometimes merely shredding into longitudinal pieces interspersed with fibers. LEAVES erect-spreading; petioles terete, 22-38 cm long, 3-4 mm diam. ; geniculum 1-1.5 cm long; blades thickly chartaceous, narrowly ovate-lanceolate, gradually long-acuminate at apex (the acumen flat, apiculate), acute to slightly attenuate at the base, 20-33 cm long, 8-12 cm wide, broadest below the middle; both surfaces semiglossy, the upper surface dark green (drying somewhat blackened). inconspicuously dark glandular-punctate; lower surface much paler (drying yellowish green) densely and conspicuously dark glandular-punc-tale; midrib prominently raised on both surfaces; primary lateral veins 13-16 per side, departing the midrib at 45-50° angle, weakly curved to the collective vein, drying scarcely raised above, prominent below; interprimary veins drying equally prominent, the dried blade thus appearing to have numerous close primary lateral veins;collective vein arising from the base, 2-5 mm from the margin, weakly loop-connecting the primary lateral veins, weakly sunken on upper surface, prominent below. INFLORESCENCE erect; usually somewhat shorter than the leaves but held above them; peduncles terete, 22-52 cm long, 3-5 mm diam., usually longer than the petioles; spathe moderately thin, green, lanceolate, 3.5-6 cm long, 5-15 mm wide, broadest just above the base, acute and apiculate at apex, acute and decurrent at base, inserted at 45° angle on peduncle; spadix white to pale green, 4.5-5.5 cm long, 4÷6 mm diam. ; flowers square, 2.5-2.8 mm in both directions, 4-5 flowers visible in the principal spiral; lateral tepals 1.5-1.8 mm wide, the inner margin broadly rounded; pistils not emergent; stamens retracted beneath the tepals after anthesis. INFRUCTESCENCE erect, the spathe persistent; berries obovoid, white before maturity, becoming tinged with purple-violet at base at maturity, all the berries emerged throughout the spadix at full maturity, obovoid, rounded at apex, with punctiform raphide cells in the upper three-fourths of berry; seeds 2 (boiled up), ob-long-obovoid, rounded at base, truncate or oblique at apex, 3.5-4 mm long, 2.4-2.6 mm wide, ca. 1.5 mm thick, flattened on one side, lacking any apparent appendage. Fig. 92. Anthurium lancifolium var. albifructum is endemic to Panama in Chiriquí Province. All collections seen are from Cerro Colorado at 1,200 to 1,700 m in premontane rain forest. This variety differs from the typical variety by having berries that are white before maturity, becoming faintly purplish at the base at maturity. The leaves also differ in variety albifructum in that they are narrowly ovate, rather than lanceolate and dry yellowish green on the lower surface. Most blades of the typical lancifolium dry rather dark. Panama Chiriquí:, 6 Feb 1986, Michael Grayum, Barry Hammel & Bonnie Bochan 6365 (MO).